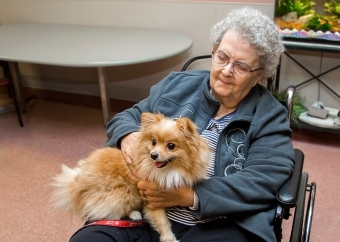 Carol Privat is grateful for the launch of Niagara Health’s first Pet Therapy Program. The Welland resident says the therapy dogs have made a big difference in her care. The Pet Therapy Program, which was launched in partnership with the Therapy Dog Program of St. John Ambulance, Niagara Region Branch, provides comfort and support to patients, their families and Niagara Health's staff. Niagara Health plans to have four-legged friends visit patients at other sites in the future.